I'm so excited to show you this! What do you think of this beautiful box? This is definitely a cute and elegant gift box for those girly girls graduating this month! You just change the embellishment and DSP and make on for the boyish boys in your life. 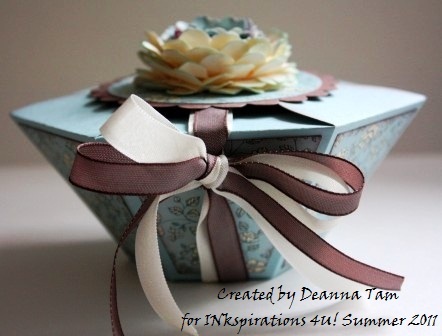 I created this box for Madeline over at INKspirations 4U!. It was fun working with Madeline. If you'd like to make this box, head on over to here and register for the Summer Edition 2011. There many other fabulous projects there that you'll sure to love once you've register. Very impressive! I see how versatile that die cut is.